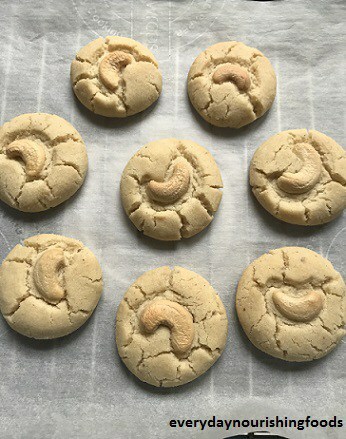 Nankhatai, Indian shortbread cookies are made using white flour and ghee. This is my Aunt’s recipe which my Mom used to make in idly cooker during my childhood days. Here I am baking these cookies in OTG oven. Though we are not fond of biscuits or cakes, I love Baking 🙂 So occasionally I make Nankhatai, buttermilk biscuits, and banana bread. These are my daughter’s favorite so I make these for her school snack. Also, I make all types of bread and pizza at home. Will share those recipes here someday. You can use butter also to make these cookies but I have used ghee which is at room temperature. If you are using the butter, you need to cream the sugar powder with butter. This recipe is simple and foolproof and anyone can easily make it. Traditional Nankhatai is made using maida or white flour. As we don’t eat these on regular basis, I prefer doing it with maida for that flaky texture. Sometimes I make these with whole wheat flour as well but they will have little grainy texture. Nankhatai are Indian shortbread biscuits made with flour and ghee. Preheat oven to 175 degree Celsius for 15 minutes. Take a mixing bowl and add 3 tsp Sooji ravva. Take a sieve and add half cup Maida to it. Add 1/4 cup powdered sugar as well. I have used unbleached cane sugar and hence the color is not white. 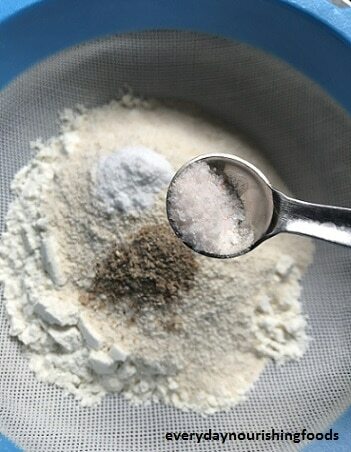 Add 1/8th teaspoon baking soda to it. Now add 1/8th teaspoon salt to it. 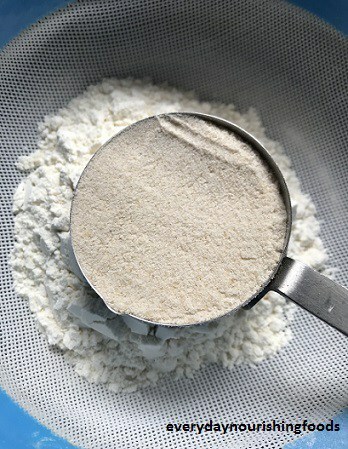 Add 1/8th teaspoon cardamom powder and sift everything into mixing bowl. 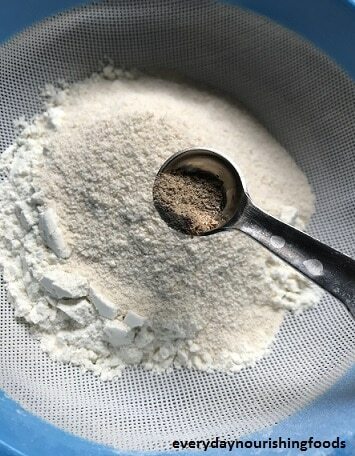 You can add cardamom powder to sifted ingredients as well. 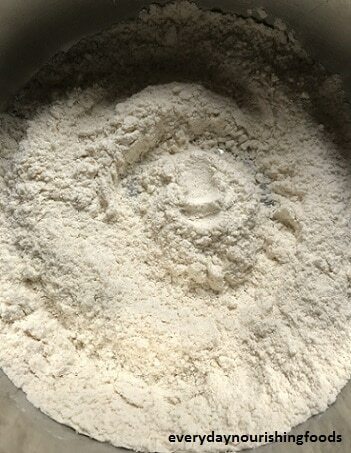 Now add 2 tablespoons semi-solid ghee to the flour mixture. Mix everything so that smooth dough is formed. If required add one more tablespoon of ghee. Do not knead, just mix with light hands so that dough is formed. Divide the dough into 8 portions and roll them into equal sized balls. Top it with cashew and flatten them little. Bake in preheated oven for around 15 to 20 min at 175 degree Celsius. Baking time depends on oven capacity and the number of cookies baked. So just watch at around 15 minutes. If they are slightly brown on top, remove them from the oven. Even after removing from oven, they cook a little bit. Once done, transfer them to wire rack and can be stored in an airtight container once cooled. 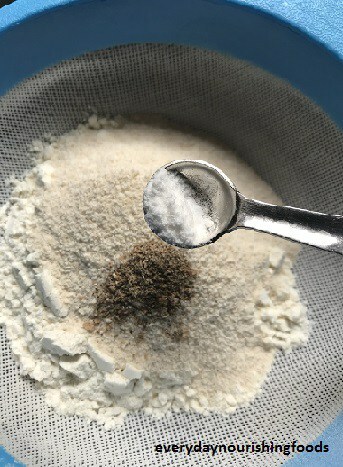 Add 1/8th teaspoon cardamom powder to it. Now add 1/8th teaspoon baking soda to it. Sift everything into mixing bowl which has Sooji and mix it well. 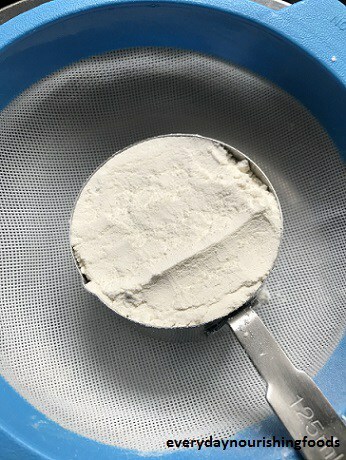 You can add cardamom powder to sifted ingredients as well. Mix everything so that smooth dough is formed. If required add one more tablespoon of ghee. 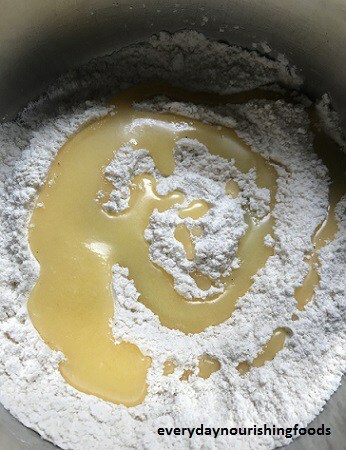 Do not knead, just mix with light hands so that dough is formed. 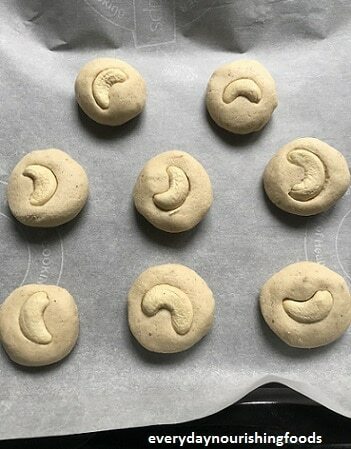 Divide the dough into 8 portions and roll them into equal sized balls. Top it with cashew and flatten them little. Once done, transfer them to wire rack and store in an airtight container once cooled.